11 September 2001 in New York; 11 March 2004 in Madrid; 7 July 2005 in London: these dates remind us that suicide bombings, or 'martyrdom operations' have become the common coin of international politics in the West. But what exactly is meant by 'martyrdom' today, whether in Islam or Christianity? This book tries to give an answer. Muslim and Christian scholars come together to find a common understanding, based on the scriptures and traditions of each faith, of martyrdom in today's violent world. Part One presents the historical background and contemporary relevance of each tradition. Part Two asks whether martyrs from one tradition could be recognised as such by the other, as well as discussing the practice of 'venerating' martyrs and examining two dramas of martyrdom by twentieth century writers. Part Three includes a study of martyrdom in Shia Islam and some short studies of past and present suicidal operations. Three appendices reproduce some classic discussions of martyrdom frequently referred to in the book, plus a plea for non-violent options within the Muslim tradition. Witnesses to Faith? by Brian Wicker was published by Ashgate Publishing Group in April 2006 and is our 54686th best seller. The ISBN for Witnesses to Faith? is 9780754656678. Reviews of Witnesses to Faith? 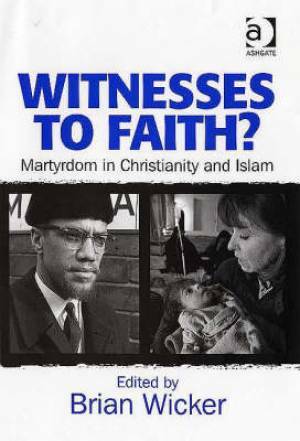 Be the first to review Witnesses to Faith?! Got a question? No problem! Just click here to ask us about Witnesses to Faith?. Details for Witnesses to Faith?